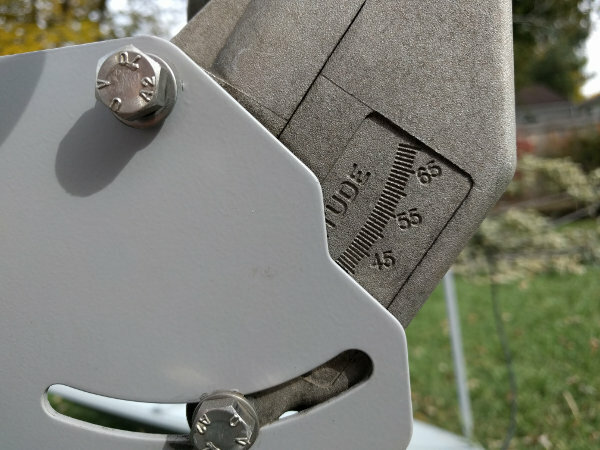 This close-up of my old motor mounted to the dish pole showed me how to mount my new motor. Hey, all you free-to-air satellite viewers who hopefully frequent FTAList! I remembered today that I forgot to tell you what I did last month. My FTA system stopped working, but I was able to fix it. It started months ago. Once in awhile, when I would tell my receiver to tell my motor to point my dish to a new satellite, it would go there, then continue on just a teeny bit too far. The channels on that bird simply wouldn’t be visible until I told the motor to switch to another satellite then switch back to the one I wanted in the first place. I shrugged and figured my 1.2-meter Ku-band dish had just shifted on its mount somehow. The glitches came more frequently. Finally last month, the motor just refused to turn in response to most commands. That STAB HH 120 motor is one of the few that can drive my large dish, and I’d had it for years, much longer than I’ve kept any one receiver. To isolate the problem, I swapped out a different receiver, different quad-shield coax cables, and bypassed the DiSEqC switch. As you can guess by the photo, nothing else helped; it was the motor that had gone bad. I remember the work it took to set up and point that motor when I first installed it, so I went looking for an exact replacement. I wound up at Ricks Satellite, home to the best wild feed forum that I know of, and Rick had just what I was looking for. I bought it, Rick shipped it, and two days later I installed it to match the photos I had taken of the old motor. In less time than it’s taken me to type this note, my motorized dish was ready for action without any repointing or tweaking. So take this as a reminder, if you happen to have a motorized FTA system, that pieces of it will go bad over time. When that piece is the motor, a few photos and an exact replacement can save hours of set up time. For once, I got it right!